For the introduction of new sizes in its custom-touring tyre range, the manufacturer from Milan organized a 3000 kilometer tour with 5 stops astride the latest model Harley-Davidson bikes. The “Night Dragon Tour”, started in Venice, Italy, and went through the Bosphorus, and ended in Istanbul, spanning six countries and two continents with the goal of introducing bikers to the new way of experiencing the custom world. Start of the Pirelli Night Dragon Tour 2012: Departure from Venice on Wednesday May 9th and arrival on Saturday the 19th in Istanbul after 3000 kilometers through Italy, Slovenia, Hungary, Romania, Bulgaria and Turkey, going through Bosphorus, astride models from the Milwaukee manufacturer: this is the “Night Dragon Tour” that was organized by Pirelli to introduce custom bike enthusiasts to the Night Dragon tyre range, recently expanded to over 30 sizes. It was also a chance to demonstrate that even in the custom world tyre selection can radically change the way a bike performs, providing excitement and riding sensations never before felt. This is why Pirelli decided to create the “Night Dragon Tour”, which gave the participants an opportunity to test the tyres in various asphalt and weather conditions and on very different routes so that they could appreciate the versatility of this product, while enjoying the beautiful scenery, providing complementary emotions to those provided by the ride itself. The Night Dragons are the new generation of custom touring tyres from Pirelli, which has always been committed to providing its customers with cutting-edge technology in their tyres, not only in the sport and super sport environment, but also in the touring and custom arena because the experience gained in the racing environment is constantly applied to the tyres which are placed on the market for the public. 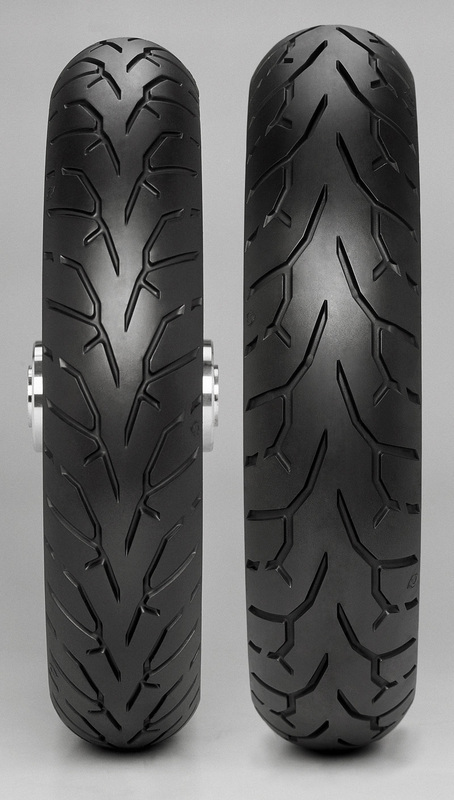 Specifically, these tyres meet the needs of those who have bikes, particularly Harley-Davidsons, which need tyres that improve grip and stability on straight stretches without penalizing the handling and high mileage that is expected from a custom bike rider. They are also designed for “sleeper bikes”, that is, those bikes with modified horsepower and torque which are used by bikers for acceleration competitions where grip is fundamental for a quick start off the line. But above all, the Pirelli Night Dragons are tyres suitable for any biker who loves to travel and eat up kilometers on a custom bike and who is looking for an exciting and pleasant ride without sacrificing tyre life. Night Dragon is just the way to look at the custom touring segment according to Pirelli, keeping pace with the evolution and needs of custom bikers in terms of traction and grip, and providing the user a unique tyre in its class. Pirelli's experience with products in the racing line on the track confirms that an improvement in the contact area through a specific design study on the tread can provide great benefits. Pirelli engineers worked hard with the main objective of improving grip and traction, putting the Night Dragon in the conditions to be able to put all the power generated by the bike on the ground. This is why the Night Dragon is able to provide performance which has never before been seen on a custom touring product. This goal was achieved working on all the elements of the tyre such as the compound, tread design, structure and profile, optimizing the contact area, the key element that can ensure excellent exploitation of the bike's horsepower and exceptional grip in any riding conditions. As for the tread, the pattern was designed to ensure a new performance level. The heart of Night Dragon development is represented by the optimization of the tread pattern with the contact area to ensure ideal contact between the bike/tyre and the road surface in any riding conditions. The grooves are concentrated exactly where they're needed, leaving more rubber in contact with the surface to ensure traction and grip in any situation. 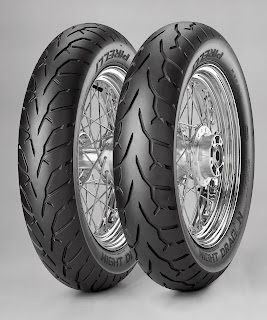 The pattern of the front tyre changes depending on the bike and the structure of the tyre, because while the radial structure is needed for higher performance bikes, conventional tyres provide the comfort that touring riders prefer, so they must have different grooves. Both the tread patterns for radial and conventional, in keeping with Pirelli style, ensure quick response and handling as well as a fun ride. This way bikers can choose whether to ride their bike with a traditional custom touring style or to explore the full potential of their bikes. Furthermore, the radial contact is wider and has less grooves to ensure that more rubber comes into contact with the asphalt and supports the performance of more powerful and sporty customs. On the other hand, the conventional solutions have more grooves which work on the contact surface. In fact, in this case the power distribution of each groove has less influence on the overall performance of the tyre. The final result is a significant improvement in terms of handling, while still maintaining all the traditional characteristics of a custom touring front tyre such as drainage capacity, braking stability and mileage. 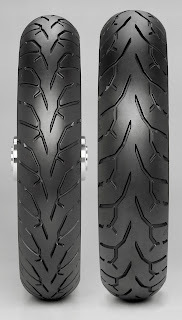 The rear tread design has a tight pattern to provide unbeatable grip and stability at any lean angle on the dry road. The grooves, well arranged between the central part and the edges, disperse what's left of the residual water from the front tyre. The tread was designed to ensure a uniform movement of the strip, ensuring its quick and even warm-up: the central section, always in contact with the road surface, ensures adequate grip, reducing tread movement which would cause wear, all in favor of higher mileage. The grooves on the shoulders serve a double purpose: displacing the residual water and accelerating movement of the tread strip, guaranteeing that the tyre will reach the proper operating temperature. The radial tread pattern has less grooves than the conventional one in order to guarantee a more slick look, as well as a smoother contact surface: lower void/fill ratio for maximum performance on the road. The radial structure tyres, thanks to the 0° steel belting, distribute the heat and pressure evenly to make tyre performance very progressive and predictable: a feeling at the same stability and grip that can be appreciated by any biker, no matter what their riding style is. This is why the Night Dragon is the reference tyre for those looking for riding pleasure and handling. But proper pressure distribution in the contact area can only be achieved with the right balance between profile, structure and tread pattern. The profile has a wide range of curvature capable of guaranteeing correct progression at any lean angle. The front tyre profile is designed to optimize the width of the contact area at any lean angle and to provide the best balance between quick and linear performance in turns and greater ease of riding. The rear profile aims to support the bike at any lean angle and to guarantee maximum traction. The Night Dragon compounds represent the cutting-edge in the custom touring segment and are designed to provide benchmark performance in all typical conditions of use. The particular structure of the compound is characterized by smaller molecular dimensions for a greater surface area in order to improve grip. The compound was also designed to give riders the possibility of accelerating at full throttle without compromising mileage, thanks to excellent wear resistance. The polymers guarantee stable performance even in wet conditions and the balanced ratio of Silica and carbon black improves the chemical grip on damp and wet surfaces.